It was one of those weeks where not much happened but I didn’t have 2 minutes to myself. It started with Monday morning and no phone lines or ADSL connection. Our overhead cables had been stolen the week before. Son no 3 woke up with a fever and a cough – he is in Grade 8 and had 2 tests this week – so I convinced him to go to school anyway and call me to pick him up if he does not improve during the day. Son no 4 also woke up with a cough – but then he has been coughing for the last 6 weeks – been to the Doc 4 times in the last 6 weeks, he has been on antibiotics etc, all to no avail – so this was not unusual. I returned home after the school run and started my workday calling Telkom to follow up on the fault report. Telkom had actually closed the ticket – the technician had marked it as complete on Friday afternoon already. So I had to open up a new fault report. I also had to call in a welder. I live in a cal-de-sac and the palisade fence at the end of my road had been broken again by unscrupulous people trying to get through to an open property. (Perhaps the same ones who nicked the phone lines.) Anyway – the welder duly arrived and fixed the palisade fence . I made an appointment with the Doc for Monday afternoon for son no 3 – could only get a 5pm appointment. This means I would only get home at around 6.30pm after waiting for the Doc (heavens forbid a doctor should be on time) and of course spending the obligatory fortune at Dischem. Tuesday started no different – cough, cough from both kids, did the school run, called Telkom. I had meeting on Tuesday morning relating to an event we have just managed to confirm. Half way through I get a call from the school – Son no 4 is not well – he can’t stop coughing – so off I went to fetch him. Telkom finally arrived on Tuesday afternoon to fix the phone line – thank goodness – rather difficult to run a business without ADSL or phone lines in today’s world. Anyway the technician ran a new cable. Apparently he ran a temporary cable – had a great debate with him as to what a “temporary cable” was. Surely it takes the same amount of effort to run a temporary cable as it does to run a permanent one. Apparently Telkom cannot afford “permanent” cable at the moment due to budgetary problems so it is temporary cable (not as good as the other cable!). The temporary cable will be replaced within the next year (yeah right!). So now had a weeks worth of emails and work to catch up on – I had been replying to the little issues but I deal with a lot of large files in my line of work and of course I have not been able to send these out with no ADSL connection – reluctant to use 3G as this costs a fortune. Wednesday was a reasonable day – kids went to school without the coughing. Spent the day in my office catching up on paperwork and accounts – end of the month so I had to do my VAT and PAYE reconciliations. Also received a call from my brother who had just returned from a 10 day trip to Croatia (who on earth wants to go there!) . Anyway – him and his family did a weeks long boat trip along the cost of Croatia and had a ball – apparently it was worth every cent and did not cost a fortune. We set a lunch date for Thursday. Thursday was a fairly normal day – finishing off month end accounts, went to lunch with my brother. Son no 4 had a hockey match so could only collect him late afternoon from school. We had another power cut Thursday afternoon – have at least one a week which lasts 2 hours (and I am assured Eskom are not load shedding!). Finally managed to get life under control by Friday morning. Had a lunch date with a very old friend of mine so sat and chatted about old times and old friends and realised how old we are all getting! Looking forward to doing nothing this weekend – oh wait – Son no 3 has to go to school for basketball practice, Son no 4 has to go out and buy stuff for a project, old friends invited us for lunch tomorrow…….. Maybe next weekend! So I have finally had my new “Entertainment System” installed in my Prius. 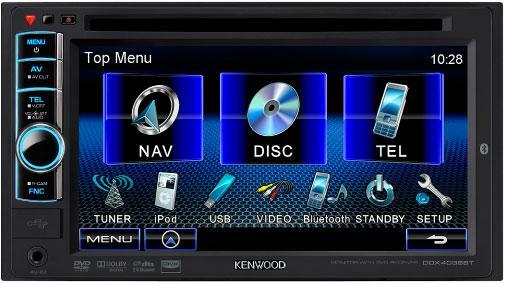 A Kenwood DDX4038BT. Toyota were kind enough to throw it into my purchase agreement for my Prius. The original system which came standard was one of the worst in-car-systems I have ever come across. The bluetooth functionality is useless and the radio was always losing signal. I would definitely not recommend you buy a Prius and keep the existing system. So I thought I would tell you what I think of the new Kenwood system….. I spent hours in the vehicle last night figuring out how it all works. My iPhone connects to it via bluetooth and it calls up all my contacts. Not rocket science nowdays as most in-car-systems can do this. The phonebook is very clumsy and very slow. You can set up presets for quick dialling – however the presents only display a number and not the actual contact – so you have to have memorised peoples numbers in order to use the preset otherwise you have no idea which number belongs to whom. If you use the phonebook – you have to have patience – it takes a while to call up and then you have to have more patience while you scroll down screen by screen – there is no quick way to call up contacts starting with H for instance. It handles incoming calls quite efficiently so can’t complain there. So I had a really good giggle and laughed that functionality off. It streams music from my iPhone as well, however no track information is displayed. I have to plug my iPhone into a cable which connects to the system to see track information displayed (a little clumsy having a cable). But this works very well. Kids like to plug their iPhones in and listen to their music most of the time. The Sat-NAV system is a Garmin so quite happy with that end. It plays DVD’s – again the system is slow to respond and it does not keep your place when you switch the vehicle off – you have to start the DVD up all over again and go through the notices etc. Not that this is an issue as I don’t spend enough time in the car to watch a DVD nor will I ever want to watch a DVD whilst driving – so this is an obsolete function. Have yet to try playing a CD or plug in a USB thumb drive – will try this later. Son no 2 (19 years old) lives in Dubai. I asked my auditors to take care of his personal tax filing so they sent him a one pager form to fill in. So a few days later I get this call from Dubai – he is filling in the form and is rather annoyed -What right does SARS (South African Revenue Services) have to ask him what party he votes for? He has asked his collegues at work as well and they all agree with him. He had no idea what COP / ANC meant and I had to explain the different marital regimes to him. I have 2 children who are no longer at home (Son no 1 and 2). One of them (son no 2) lives in Dubai in fact. So when he came out to SA for a 2 week holiday, I was thrilled at the idea – especially at the thought of having all 4 of my boys together and us spending time together. My sons all get along – of course there is sibling rivalry and testosterone levels which seems to hit the ceiling when they are all together, but generally speaking there is a good atmosphere when we are together as a family. We have some great laughs. However….. Things seemed different this time. Not sure I can put my finger on why – Son no 1 and 2 just couldn’t seem to see eye-to-eye on anything. Son no 2 wanted to help out around the house – do odd jobs, fix this and that. Son no 1 seemed irritated about this – found fault with everything son no 2 did. We had a braai last weekend – we were all together outside – they were all ragging each other as usual. Son no 3 had a school project to do – this involved a ladder. So the experiment was done and of course the ladder had to find its way back into its usual storage space. So we now had 4 “experts” all telling each other how to fold the thing up. (Not rocket science, but they all had their own opinion on how to do it). Of course things got out of control and son no 1 went off in a huff. I went off in tears – I had spent all morning in the kitchen making salads and making sure their favourite foods were all prepared. I was very upset at the thought of having lunch with 3 of my 4 sons and was extremely hurt at the thought of son no 1 not being able to tolerate being with me or his 3 brothers, especially taking opportunity to spend time with his brother who he seldom sees as he lives a million miles away. He of course denies it was the ladder issue and we had a heart to heart about the issue a few days later. Things however were not quite the same after that – they just seemed to tolerate each other – there was not the usual laughter and fun and games as normal. My hopes are that my sons (all 4 of them) will be best friends and will be there for each other during their lives. My hopes are that all 4 of my sons and their wives and children will be visiting their mother once a week for Sunday lunch. Is this the end of my hopes and dreams? I know deep down inside they will be there for each other when the necessity arises, I just wanted more than that. Perhaps I am very naive!